Following the positive spirit that came with the Coffeeneuring Rides, we're going to keep the bikes rolling in the same manner. All year round. Beginning Saturday December 27 we'll do one ride a month (except when we don't). The ride will be on the last Saturday of the month (except when it's not). The first ride, December 27th, 9am, will depart from Kaladis at 26th & Minnesota Ave. Here are the 6 things you can expect from the ride. 1. Meet the group at a coffee shop at 9am. Riding to the venue is preferred, perhaps even rewarded. 2. 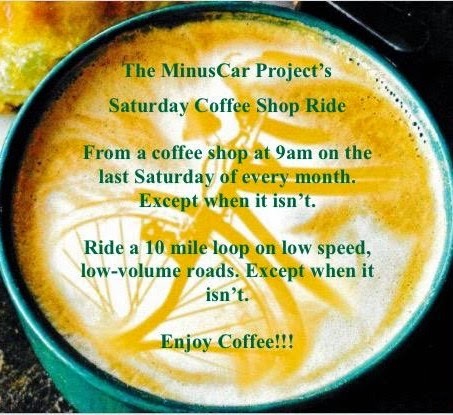 As a group, ride a 10-ish mile loop from the coffee shop. 3. If you can ride 12mph for an hour on the bike trail come ride with me - I won't leave you. If you can ride 20mph on the bike trial for an hour you might find this ride too mentally taxing. 4. Rule #2's distance is adjustable depending upon weather conditions. We'll aim for a 2 mile minimum loop. 5. The route will be primarily on-street miles. Street selection will lean toward low volume (except when it doesn't). 6. Enjoy coffee together at venue.